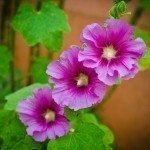 what’s causing early hollyhock blossom drop? Every day there are hollyhock blossoms that have fallen from the stalks. The blossoms are NOT withered. Seems like something is severing them off. We have noticed some ants on the stalks, but otherwise the plants look very healthy. If you see ants it can be because they are attracted to honeydew, which is a secretion from other insects. Try spraying the plants with Neem Oil.